Firefox and Chrome are the two most popular web browsers for Ubuntu, But there is a another very good browser called opera. This tutorial explains How to Install Opera in Ubuntu 18.04 LTS. Opera is fast and secure web browser that support cutting edge technologies. If you are looking for alternative web browser for your Ubuntu Desktop, then opera should be your first choice. download opera for Ubuntu 18.04. Install Opera with gdebi command. Opera provides deb package for Ubuntu, the best way to install deb packages is to use gdebi command line tool. So first open the Ubuntu terminal and install the gdebi-core package. Next, go to www.opera.com and download opera for Ubuntu 18.04 (Save deb file to your hard drive). You should replace the deb package name according to one you downloaded. During the installation process, it will ask to configure your system to include new versions of the opera package together with the regular system upgrades. Select "Yes" and wait for the complete process to finish. 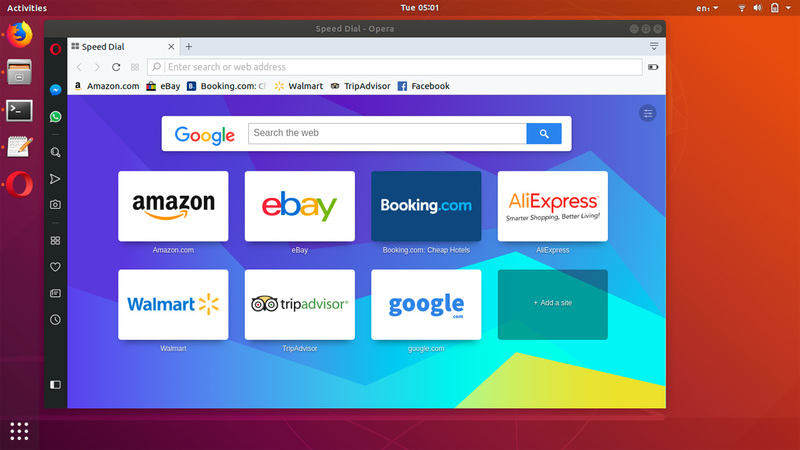 Once the process is complete, you can opera browser from the Ubuntu application menu. The command will install the updates if a new stable version is available. It is very important that you update the browser regularly. If you want to make opera your default web browser in Ubuntu, Open the browser and press ALT+P on on the keyboard to open opera settings. Under the default browser section, click on "Make Opera my default browser" button. Alternatively, you could also uninstall opera from the Ubuntu software center, under the installed packages.